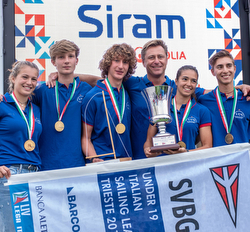 J/News Articles: SVBG Win Italian Youth J/70 Sailing League! 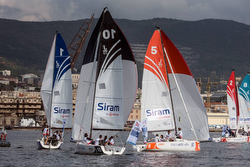 (Trieste, Italy)- This year the Italian Championship for Club Under 19 was supported by BarcolanaFun and Siram by Veolia. The local host and organizer of the event in Trieste, Italy was the S.V. Barcola and Grignano and the principal sponsor was Banca Aletti. For the eighteen crews that participated, the event started off with an AP over A on the first day, with little wind and lots of rain. Nevertheless, the boys and girls participating in the event, were challenged ashore by the Est Energy SpA to generate as much energy as each team could in a winch-grinding competition to raise money for charity. All the energy they produced was converted into a donation for the local Burlo Garofolo Hospital in Trieste to benefit their children’s charity! Following that slow start for sailing, but a big step for benefitting the children’s hospital, the Youth Under 19 teams had a spirited round of races on Sunday to determine the ultimate youth champion sailing on J/70s. In the end, it was the local youth team on SVBG that won, followed by the 3V SAILING CENTER taking the silver and the ADRIACO YC Youth Team taking the bronze. In addition, the “Glam Team Award” went to Torre Del Greco Nautical Club, the Youngest Team Award to YC Adriatico, and the Fair Play Award to SVBG. One of the more entertaining elements of the regatta was to see the SVBG PRO and RC team playing with their new robot buoys- watch them play here (they work!). Sailing photo credits- Fabio Taccola Follow the Italian Under 19 J/70 Youth Sailing League here For more Italian J/70 Sailing League information Add to Flipboard Magazine.